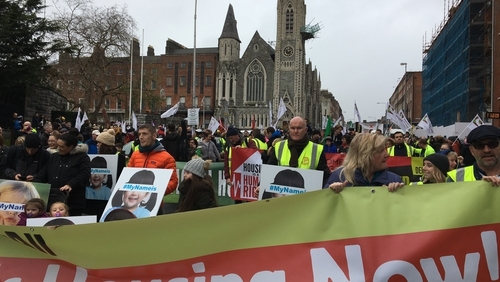 A protest to highlight the housing crisis has taken place in Dublin City centre with up to 10,000 people estimated to have taken part. The National Homeless and Housing Coalition organised the march. Chairperson Tina McVeigh of People Before Profit said they want to keep pressure on the Government. She said the Government has ignored a cross-party motion calling for a number of measures, including a constitutional right to housing and an end to evictions into homelessness. Homeless campaigner Peter McVerry said the Government had lost control of housing and that problems will continue as long as it is in the hands of the private sector. The coalition represented around 50 groups including local community groups, SIPTU and Fórsa unions and homeless groups. The Irish Traveller Movement took part with spokesperson TJ Hogan saying they were there to show solidarity and to highlight the lack of provision for Traveller accommodation. Traffic disruption was expected as the march moved down O'Connell St and turned right along the quays and on to Parliament Street, before ending on Dame Street for a rally. Protesters called for a number of measures including a declaration of a housing and homeless emergency, a constitutional right to housing, an end to evictions into homelessness, more rent controls as well as more social and affordable housing. A minutes silence was observed to mark the fourth anniversary of the death of homeless man Jonathan Corrie, who was found dead near the Dàil on 1 December 2014.